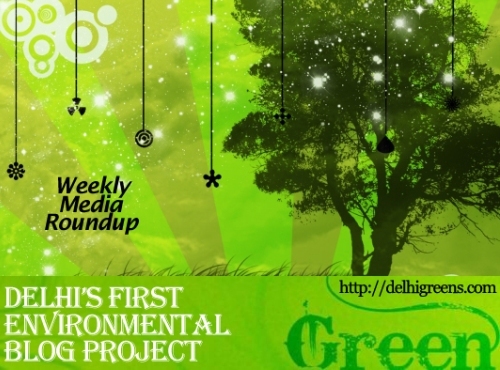 Weekly green news roundup from across different media networks for week 33 (between Aug 10 to 16) 2015. Increasing the number of CNG buses, crackdown on polluting vehicles and industries and tree plantation drives are some of the many steps being taken by the Delhi government to curb rising pollution in the national capital, a statement said on Thursday. The National Green Tribunal today directed Central Pollution Control Board, Delhi Pollution Control Committee and IIT-Delhi to conduct a joint inspection of 13 common effluent treatment plants which are located in various industrial clusters in the national capital. The National Green Tribunal today directed Badarpur and Rajghat Thermal Power Stations to bring particulate matter within permissible limits after an inspection report highlighted their high content in the ambient air around these projects. The Government today said it will soon launch a “massive” people-oriented awareness campaign to check air pollution, and asserted that it has adopted a “consultative and cooperative” approach with the states to deal with the menace in and around Delhi. Irked by the blame game by various departments within the state, National Green Tribunal on Tuesday imposed a fine of Rs 1 lakh on the Delhi government for not following its orders on implementation of Maili se Nirmal Yamuna Revitalisation Project 2017. Yamuna water in Delhi and nearby is all excreta and effluent, several reports including Central Pollution Control Board’s latest assessment at interstate borders has shown. The Centre has informed that it is planning to take up works pertaining to cleaning Yamuna river in addition to the existing scope of Japan International Cooperation Agency project. The war of words that has broken out between MCG and HUDA, has inadvertently exposed the truth about the city’s water supply and drainage networks — that may actually be running on makeshift arrangements. The Centre for Science and Environment has challenged the Council for Scientific and Industrial Research’s recent conclusions based on the draft findings of a joint study that buses running on CNG may be more hazardous to health than diesel buses. In order to bring maximum area of the city under its network, the Delhi Jal Board today announced to extend sewerage facilities to seven new unauthorised colonies here. Realtors continue to clandestinely draw groundwater and drain them into sewage lines and the Yamuna, a report by an NGT-appointed inspector alleges. Automobile service stations operating in the capital and discharging toxic pollutants like grease and oil into the Yamuna have come under the radar of the National Green Tribunal which has sought a status report on their functioning. Inspectors of central and state pollution control boards are filing ambiguous and incomplete inspection reports, with grave consequences for the environment, the National Green Tribunal (NGT) has said, warning of heavy fines. In order to save biodiversity and make tree plantation more efficient, Delhi Government has decided to plant native trees instead of exotic species in the city. 347 species of flora and 424 of fauna, including two reptiles have been discovered in the country in 2013-2014, environment minister Prakash Javadekar informed Lok Sabha on Tuesday. An International climate variability and predictability monsoon project office will come up at the Pune-based Indian Institute of Tropical Meteorology, an official said on Wednesday. Over 1,500 billion cusecs of water flow has reduced in the Ganga catchment area of Himalaya due to falling of trees and destruction of other vegetation areas to make way for urbanisation and road construction in the Himalayan region. It came as a shock to those who recently attended the annual climate conference organised by the Tata Institute of Social Sciences in Mumbai to learn that there were only some 20 days left before India submitted its commitments to the UN global summit, culminating in Paris this December.